If you've ever looked at my spreadsheet, you know that I have a LOT of ILNP polishes. I love them so much, from the beautiful packaging, the wide brush and then THE HOLO! Sometimes it's hard to capture on camera but in the sun? Oh man, the ILNP polishes are a showstopper. Today I have Citrus Punch from the Summer 2017 collection. 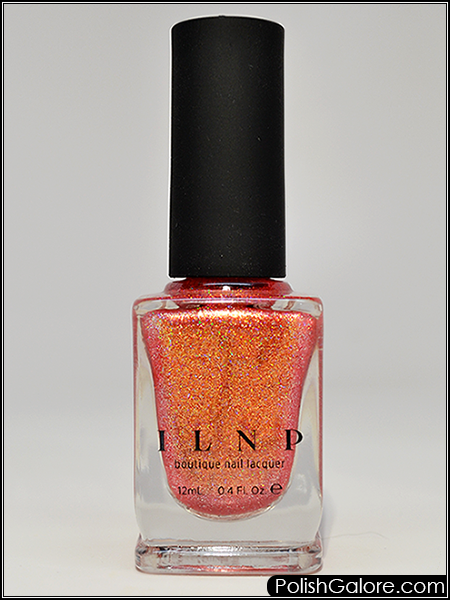 This is a crisp coral holographic polish with micro-flakes that almost put off a golden shimmer in the right light. I used a base coat of Duri Rejuvacote, 2 coats of polish and finished with Glisten & Glow top coat. I was a little nervous at the first coat because it appeared sheer but I should have know better because the second thin coat made the polish perfectly opaque. Look how happy this polish is! The holographic sparkle totally came out to dominate but on my index finger, you can see that golden shimmer. I'm on the fence about this polish on its own. I don't know if I love it against my skin tone but I think it would be really pretty as a base for some black stamping. I got a clear jelly stamper at Indie Expo Canada that I want to try.